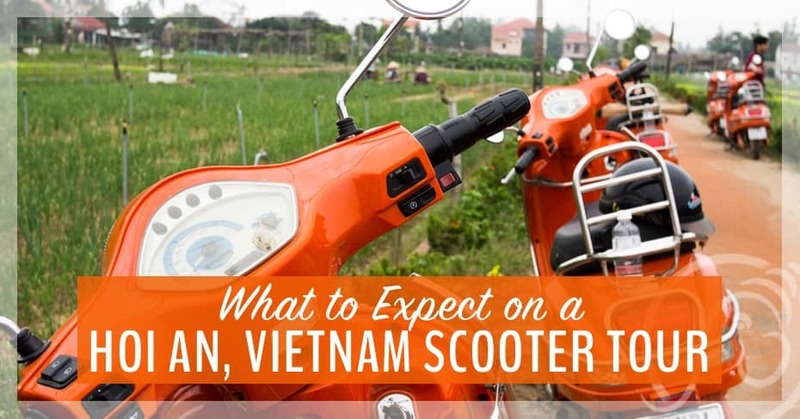 There’s no question that the best way to get around Hoi An is on two wheels. I spent many happy days cycling around the ancient streets of this UNESCO World Heritage city. Merrily ringing my bell, I derived a little too much pleasure at the sight of unwary tourists diving out of my way. But there is plenty to see outside of Hoi An’s ancient walls and for that you’re better off on a Hoi An scooter tour. The trip starts, as all great road trips do, in a parking lot. My tour companions, a boisterous family of South Africans, have chosen to drive their own scooters. Their driving test consists of turning a tight circle around the parking lot a few times. The controls on these silent electric scooters are pretty basic and they only go up to 40 kph so I’m tempted to jump into the driver’s seat myself. However, the recurring sight of bandaged and broken backpackers in Vietnam (almost all with scooter-related injuries) convinces me to take the safer option. I ride pinion behind our guide, Mr Thao, leaving my hands free to snap photos as we drive (and greatly decreasing the odds of a hospital visit during my final week in Vietnam). 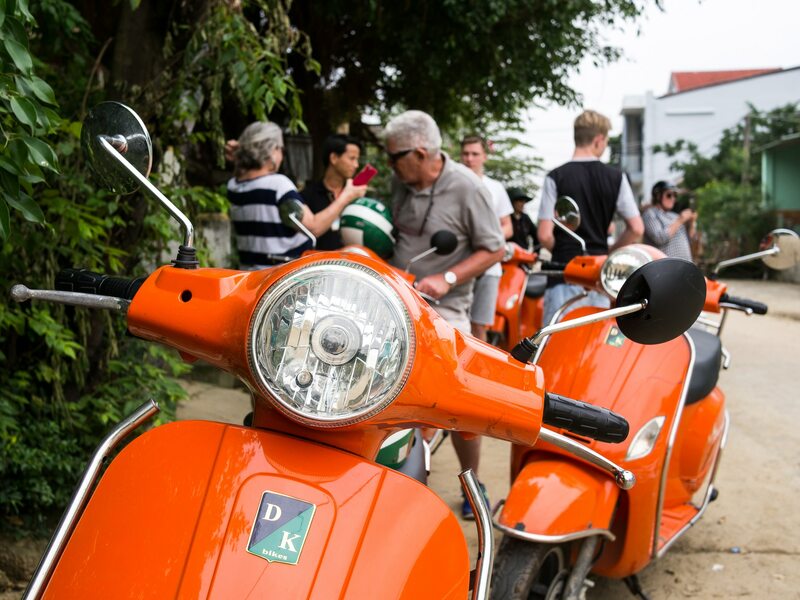 Our bright orange convoy winds through the centre of Hoi An before crossing a bridge into an entirely different world. On the small island just outside of town, the road narrows to a single concrete track and the tiled houses are spaced far enough apart to give each resident the room to raise chickens and grow their own veggies. 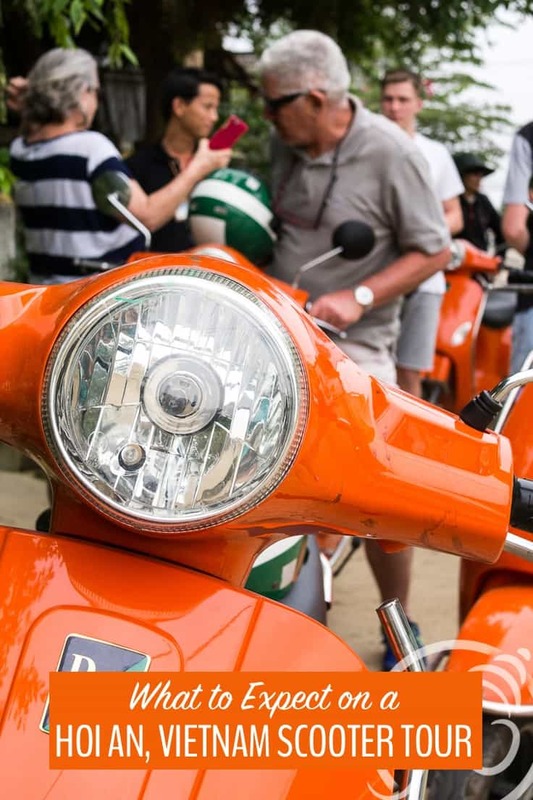 You couldn’t miss these bright orange babies on the road! We stop by a shipyard — just a couple of old wooden boats hauled up from the river for repairs. Mr Thao tells us that when the river was the main mode of transport, this used to be a booming shipyard where riverboats from all over came to be repaired. A few kilometres away, a smiling woman shows us her backyard rice cracker business. 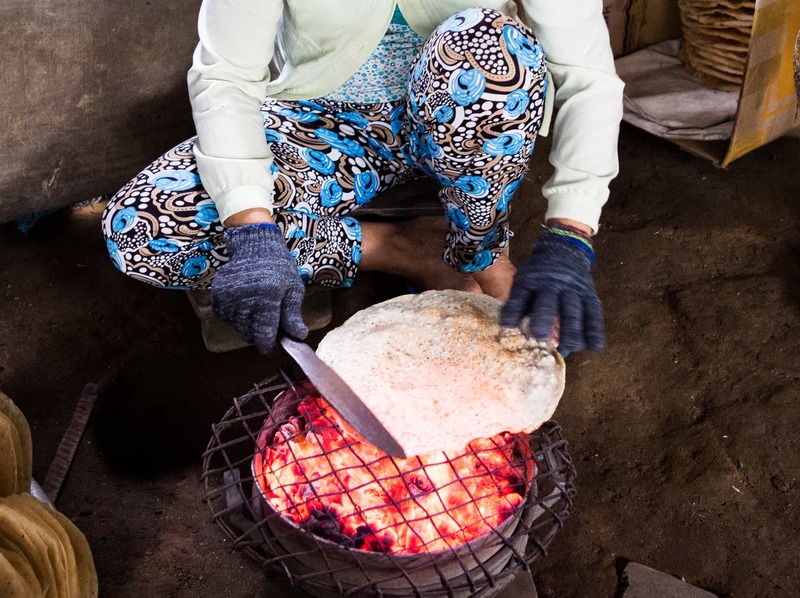 She flips a single circular rice cracker over a glowing coal fire until it puffs up and turns a crispy golden brown. The bulk of her day is spent sitting on a low wooden stool just six inches off the ground, wearing a pair of mittens to protect her hands from the fire. On a cool day like today, the fire keeps her warm, but roasting rice crackers in the 40-degree heat of summer must be hot work. Rice cracker roasting must be hot work in summer. Another neighbour invites us into his front room to show us how Hoi An silk lanterns are made. 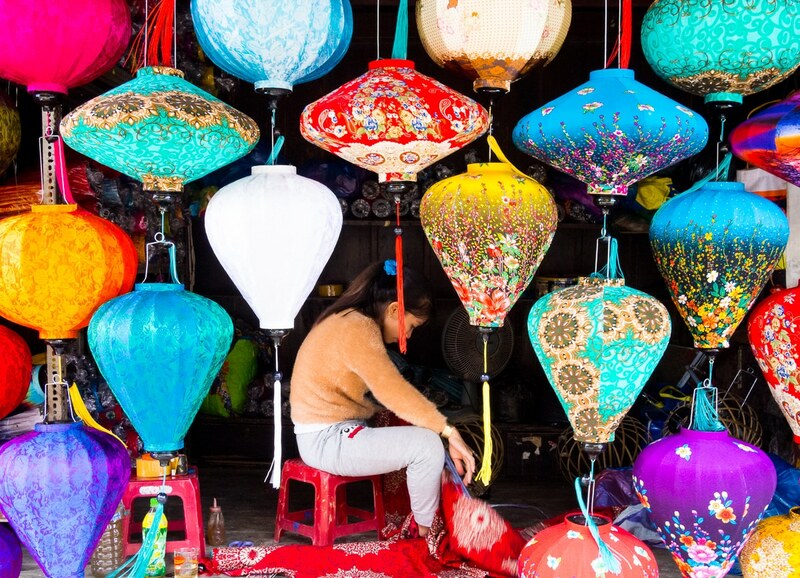 The husband and wife team build and sell dozens of lanterns per week. The man does all the “hard” work, Mr Thao jokes, cutting the bamboo stays and forming the wooden lamp ends. The woman is responsible for the “easy” labour of cutting and pasting on the silk lamp shades and dealing with customers every night in the local market. This is a true cottage industry and it’s good to see that hand-made items still do exist here. I’d rather make the lamps than deal with tourists in the night market! The next stop is the shoemakers, another family-run enterprise. Here, four or five young men sit on the floor, using scissors to cut uppers, tongues, and haute-couture logos out of large swatches of leather and microfibre. 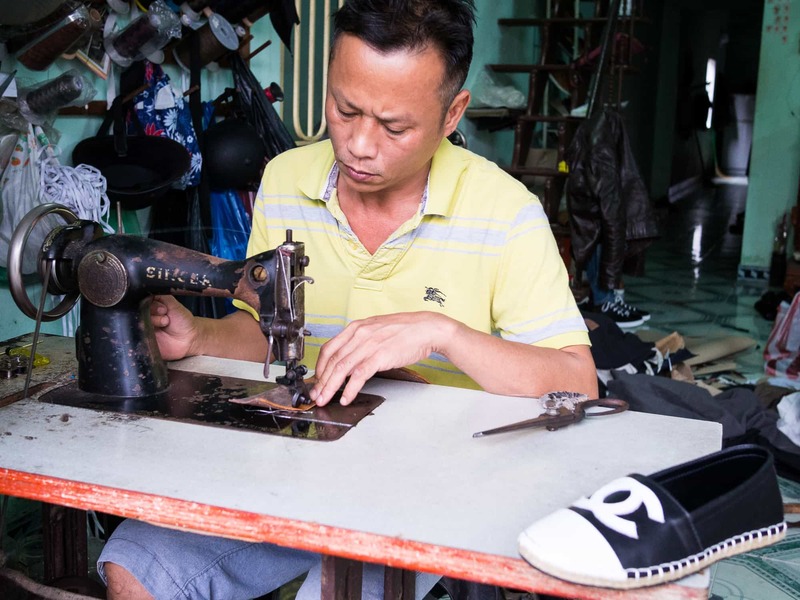 The head shoemaker sits at his sewing machine, piecing the parts together. 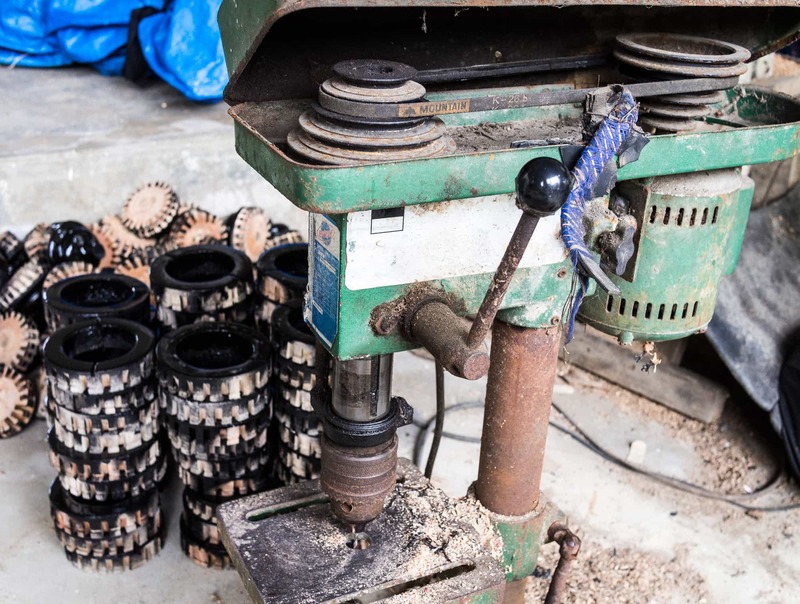 But the most amazing task takes place out back, where a woman creates the rubber soles and sets them in a microwave oven. 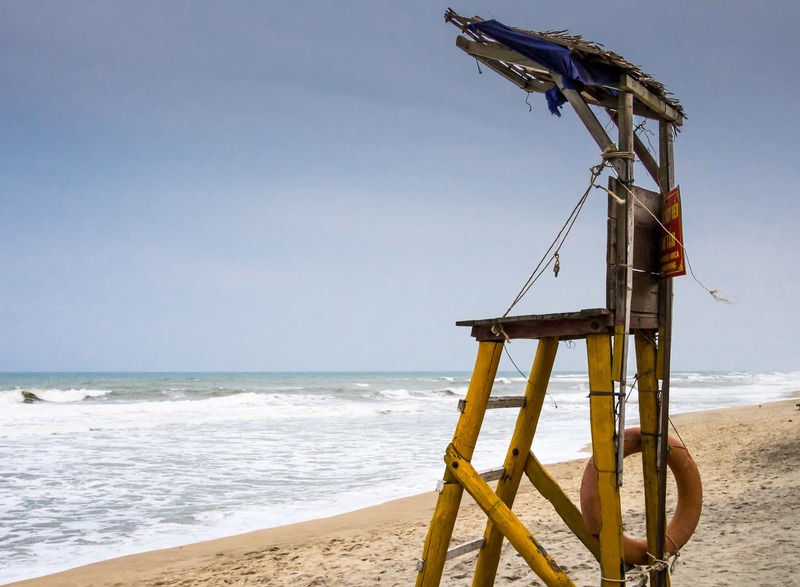 No tour of Hoi An’s surroundings would be complete without a trip to the white sands of An Bang beach. But before we make it there, we stop at Tra Que, an organic farming village just a few minutes from the beach. I’m usually not too excited about gardens in any of their touristy forms — botanic, organic, or zen — but the organic farming village turns out to be the highlight of the day. 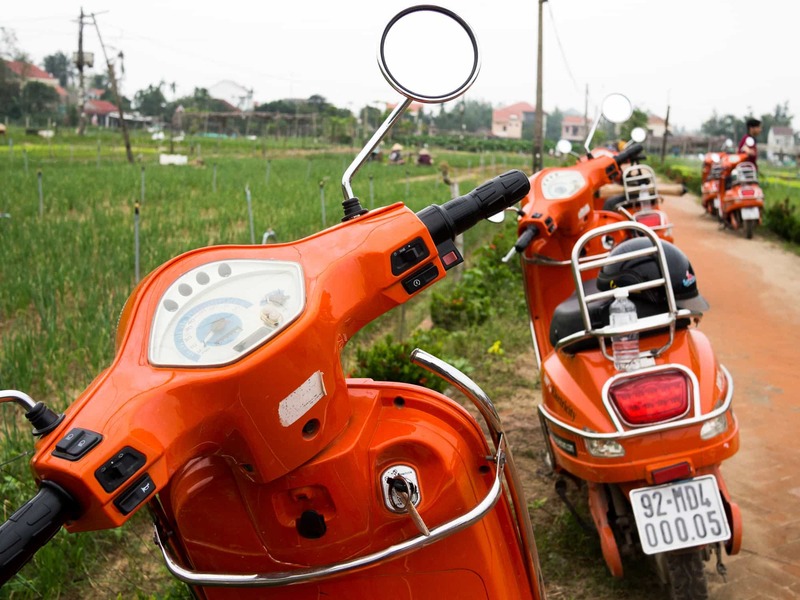 Electric scooters amid the organic fields near Hoi An. Surrounded by tall Vietnamese homes, a patchwork of green fields grows most of what I’ve eaten in Hoi An during the past week including sweet potato, mint, fish mint, basil, green onions and morning glory. Rows and rows of orchids peak their leaves up from the soil, getting ready for the huge New Year’s celebrations in February. Each plot of land is managed by a separate family but no one is allowed to used chemicals on their crops. Buffalo poo, Mr Thao gleefully tells us, is spread liberally for fertiliser and bugs are kept at bay by planting a variety of crops and a liberal sprinkling of lime. Sadly, the organic gardens are shrinking every year and houses are rising in their place. Women work the land, crouching to pull weeds and hefting hoes between the rows of crops. One woman slings two steel watering cans over her shoulders and alternately sprays neighbouring rows of plants with a deft twist of her shoulders. It’s hard work managing the family land but the women manage it with a smile. 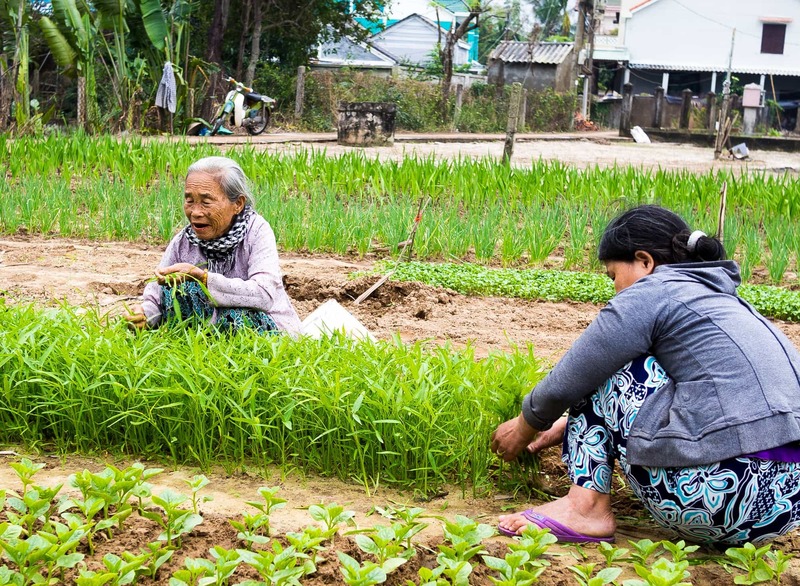 Travelling in Vietnam, I am struck again and again by how hard-working women are here. They appear to provide the muscle and the brains that keep the country going, but they’re also responsible for the household, raising their kids and cooking family meals (which usually includes their husband’s parents). It must be a hard life and I can’t help but marvel at the optimism of the women I’ve met. While An Bang beach is undeniably beautiful, the cold blustery day forces us to seek shelter at Soul Kitchen. Fortunately, the beach bar is open and beers are offered all around. I drink hot tea; it’s much too cold for beer. An Bang beach is beautiful, if a little cold, in the middle of winter. As we roll our way silently back to the city (electric scooters are even quieter than bicycles), bypassing lines of traffic stuck at lights and zipping along narrow alleys, I wonder why more North American cities haven’t yet been overrun by electric scooters. They seem to be the perfect mode for city travel: inexpensive, fast, easy to drive, and you can park almost anywhere. Try an electric scooter in Hoi An and you’ll want one when you get back home too! *I was a guest of Hoi An Express and Scooter Tours Vietnam for this tour. All opinions are my own. This is a very interesting idea and, I have to admit, that I had not thought of a scooter tour before. However, it does seem like they would be quite easy to use to quickly navigate around a small area. I also imagine that they are more fun to tour with rather than being stuck in a hot and humid car or bus. Definitely more fun than your standard bus or car tour! There were a couple of people who had very little experience on the scooters and were able to drive easily. I chose to ride on the back so I could take photos and video while we were going along. I stayed in Hoi An for eight days in 2015 and loved this town. 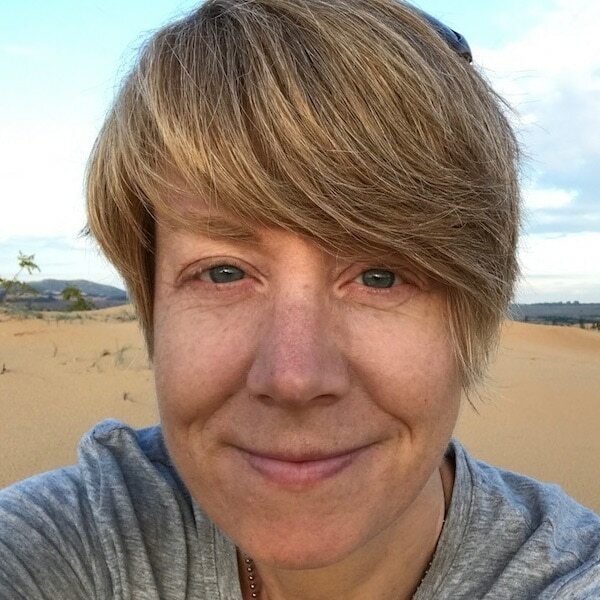 The food, the beach, the culture…awesome. I know, gorgeous right? I almost felt as though I could stay forever. Or at least a few months!